Helen Jenkins, Librarian at Carlucci American International School, Lisbon, explains how Britannica resources have helped their school. We needed up-to-date content, and current information for all subjects studied at the school, that would cover multiple grade levels. We had always had print encyclopedias but we had to have multiple sets to cover different reading levels, multiple simultaneous users and the hard-copy sets had to be replaced regularly because they were essential out-of-date as soon as they were printed. What made Britannica stand out in making your choice? Britannica has always had an excellent reputation and it is now an excellent electronic resource because it is so current and inclusive. How has your institution benefited from using Britannica? Our resources and information is now constantly up-to-date, is available to all students at school and at home, and is available at multiple reading levels. 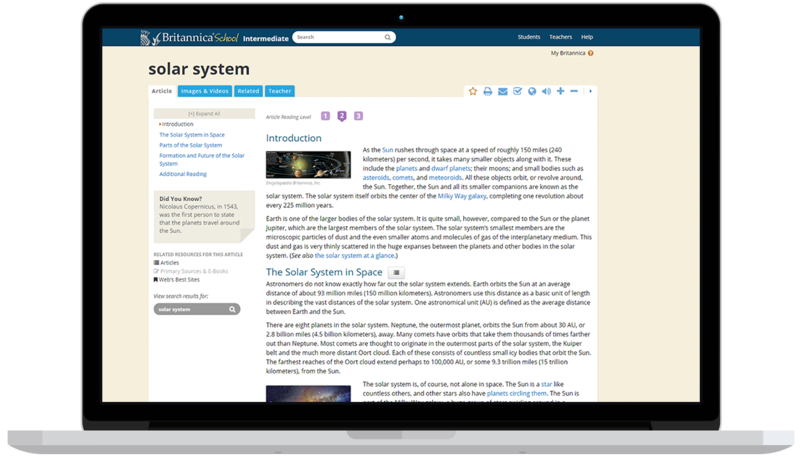 It is nice to know that Britannica are working closely with schools and librarians to ensure that the resource is especially useful to teachers. Britannica School has helped Carlucci American International School students and teachers, and we would love to show you how we can help your school. For a short, free demo click below and one of our team will be in touch to arrange a time to suit you.